We have now based most of our work in Wales and we are updating our website with the intention of presenting most information in English and Welsh. Our main focus is researching the shared histories and links between communities and countries, and telling these stories using a range of approaches working with poets, teachers, authors, academics and entertainers. We are currently exploring the links that Wales has around the world, as well as exploring ways to celebrate Welsh Language and Culture. We work with a wide range of organisations and schools, including Arts Council Wales, (see Cwtch), Race Council Cymru, Rotary International and Wales International/ Cymru a'r Byd. Find out more about our Creative Arts Team and our Heritage Research Team. Learning Links was developed initially 10 years ago, see "Remembering 2007 in 2017". Now our research and projects cover an even wider spectrum, as we identify new links and opportunities for research by community based volunteers in countries and communities around the world. Please use this site to explore how we can link with your interests, by finding out about the projects and activities we have been involved in, and also about some of the ideas we have for developing some of these threads and the new challenges we are taking on. We are always delighted to hear from people interested in our work and activities! There are many ways to explore and share stories, please contact us if you have an idea or suggestions to make. 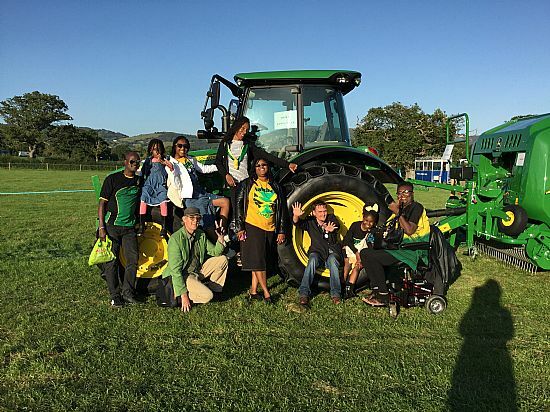 Here are members of the Learning Links International Jamaican delegation who visited the Denbigh and Flintshire Agricultural Show held in North Wales in August 2017. In August 2019 we have plans for a Welsh Delegation to visit the Denbigh Agricultural Show in Jamaica. Get your name on the list through "Contact us"!